We often think of an “accident” as a case of pure chance, which could not have been helped. In fact, many accidents are preventable. They are caused by negligence or carelessness by a specific person or company, not by mysterious forces beyond our control. 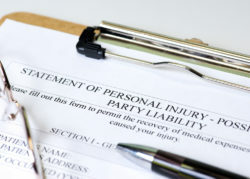 In a personal injury case, determining legal responsibility for the injury – also known as “liability” or “fault” – can be complex. Answering this question, however, is essential to determining who should pay for the costs imposed by that injury. Typically, the first step in determining fault is to look for evidence of “negligence,” or a failure to use due care to prevent harm. What counts as “due care” often depends on the specifics of the situation, any safety rules (such as OSHA regulations or traffic laws) that apply to the situation, and the relationship of the parties to one another. For example, employers, property owners, and manufacturers and distributors of consumer products have “due care” responsibilities that can differ slightly from the care one ordinary private citizen owes to another. A fault determination can also be complicated by the actions of the injured person. For instance, if the injured person was also careless, he or she may be found to bear some responsibility for the accident. The injured person’s total damages award may be reduced by a percentage equal to the percentage of fault assigned to the injured person if rules of “comparative negligence” apply. Also, more than one person may be at fault in an accident, such as during a multi-vehicle car crash. In this situation, you may be able to recover from any one of the liable parties, who must then determine among themselves which of them should compensate the others. If you’ve been injured and you suspect someone else’s negligence was to blame, don’t hesitate to talk to an experienced attorney who can help you understand and pursue the best legal options for you. Contact The Law Offices of Richard A Stoloff today for more information. Our number is 609.601.2233 or you may fill out our convenient online contact form.